My schedule always seems to be full and in flux. I was not sure if I would be hiking on the weekend or not until Friday. Once I knew I would be hiking I immediately checked the weather for both Saturday and Sunday. Neither day was ideal, with a chance of rain each day. On Saturday the prediction was for a low chance in the morning and increasing by afternoon. Sunday had a higher chance for most of the day. Saturday appeared to be the best of the two days. Even though it would be cloudy all day the chance of rain was low until later in the day. If it did rain it would likely be near the end and I would have a shorter time to hike in the rain and damp. I decided to get an early start so that I could get most of the hike in before the chance of rain increased. I woke well before dawn in the darkness of early morning. I began loading my gear into my car around 5 am. While I was loading everything into the car it began to sprinkle; not a good omen. It wasn’t supposed to rain until much later in the day, but the trailhead was 100 miles west, so the weather would likely be different I told myself. I set out on the long drive to the west as the sky began to brighten behind me. I could see the colors of the sunrise in my rear-view mirror as I drove. The sprinkles that had started while I was packing turned to rain; this was not giving me confidence. I drove on and the colors of the sunrise faded to gray as the clouds thickened. I continued driving, the rain faded away for a time and the road dried. I continued to pass through areas of rain and dry for the rest of the drive to the trailhead. 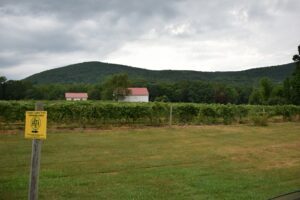 I arrived at the parking area along CR 88 next to a vineyard under cloudy, but dry skies. I checked the local radar on my phone; there were showers to the west, but they were moving north-east and would not pass over me. I changed into my boots and pulled on my pack and started out across the vineyard’s fields (mile 0.0 – 7:05 am). At the far side of the field the trail turned to the right to follow along a fast-moving stream before coming to a bridge that crossed over. Once across the stream the trail turned back along it before turning away and onto an abandoned railroad bed (mile 0.5 – 7:17 am). The ties and rails were still there, but the tracks were now very much overgrown. 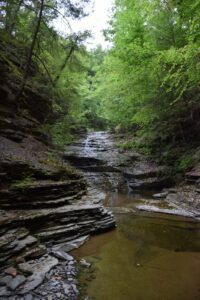 The trail followed the railroad bed for a short distance before leaving it behind and starting to climb up along another little stream – Mitchellsville Creek. The trail continued to climb as the stream plunged deeper into a gorge on my right. The woods were deep and dark here. Needles from the many pine trees carpeted the ground and softened the sounds. It was quiet. I reached a turn in the trail, but I could see a path that headed out to an overlook above the gorge (mile 1.4 – 7:40 am). It looked a bit narrow so I decided to leave my pack at the edge of the trail; I did not want to have the extra weight unbalance me. I walked out along the narrow path as the sides dropped away on either side. I could see a waterfall down below me on the left and a small path where people had made their way down. I carefully climbed down the side to stand at the top of the waterfall. I took several pictures and then made my way down the side of the waterfall. Once I had made my way down I found another small waterfall, I took more pictures before climbing back up. Finally I decided that it was time to get back on the hike. As I started to climb back up to the narrow path a few light sprinkles of rain landed on the rocks beside me. I reached the narrow path and headed carefully back to my pack and the main trail. I picked up my pack and started off. I could hear the light patter of the rain above me in the tree tops. I came upon a trail register a few minutes later, this one was one of the FLT Passport Program registers sponsored by Wegmans . I stopped to sign in and take a picture. It was dark enough now that the flash on my camera needed to fire. I could hear the rain starting to pick up in intensity, but the tree cover was preventing much of the rain from making its way down to the ground. After signing the register I moved on and came to small field crossing (mile 1.56 – 8:03 am). The rain was coming down at a steady pace now and I knew I would get wet as I crossed. I stepped back under the trees and pulled out a plastic storage bag from my pack. I placed my camera, extra battery and charger in the bag and sealed it. I reshouldered my pack and started across the field, the rain pattering down on me. After crossing the field the trail continued to follow along the edge of the gorge. 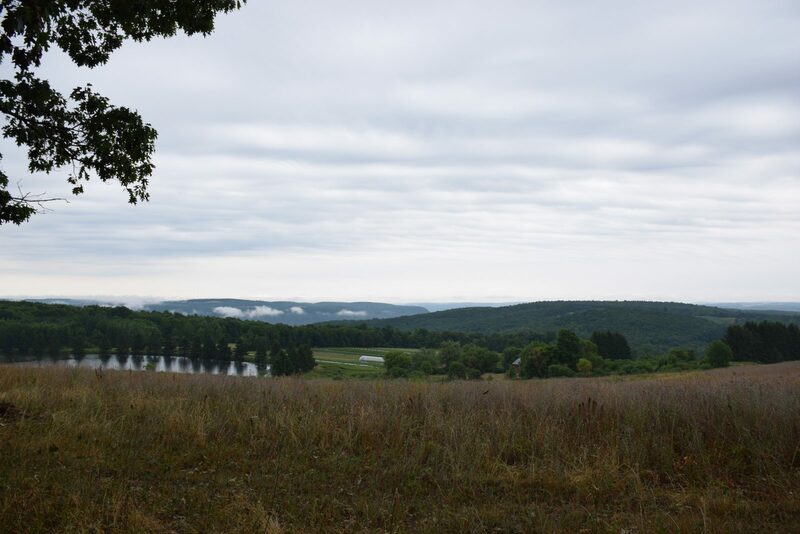 I came to another overlook and stopped to take a few pictures (mile 2.2 – 8:20 am) . The rain was still falling at a steady rate and I could see it coming down above the trees as I looked out. I attempted to get some pictures angled up at the rain, but my only reward was a spotted lens which I had to wipe dry before repacking my camera. The trail started to curve away from the gorge and soon left it behind. 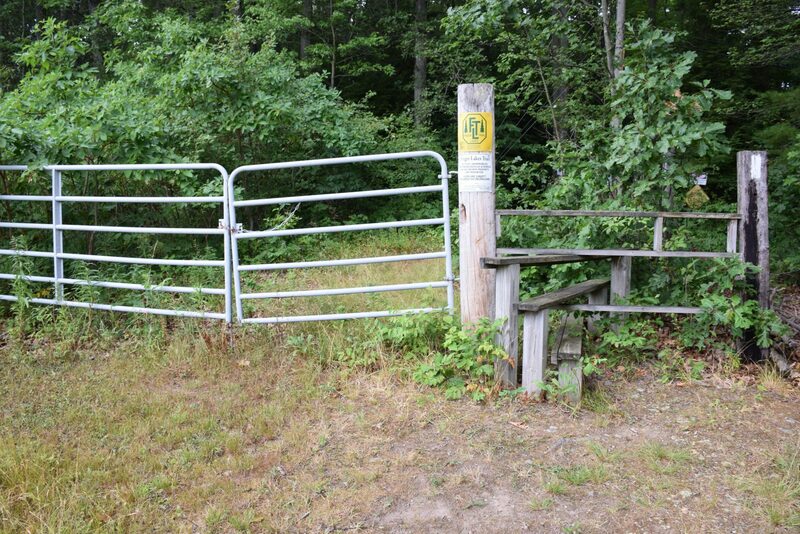 Shortly I came to a closed and locked gate (mile 2.43 – 8:29 am). On the other side I could see a field and beyond that CR 13. Several cars passed on the road, their tires hissing on the wet pavement and wiper blades swishing back and forth. I stepped back under some trees for a few minutes to let the rain ease. The rain slowed a little and I decided to start across. Although the rain had slowed it was still coming down and I decided to skip taking pictures of the crossing for now and get some on my way back. I moved quickly across the field, my head down. I arrived at the edge of CR 13 and slogged across and then across another small field until I was back under the trees once again. The trail started to climb quickly. The trees were not as thick here and the rain was able to make it through. As I climbed the steep slope the rain picked up again and I could hear it hitting the leaves above me and feel the drops. About half way up the climb I stopped and ducked under a tree to get a break from the rain and catch my breath. After a few moments I continued on up the hill. The rain finally stopped as I neared the top. I reached the top and the trail turned to the left while a field opened up to my right. I decided to stop and take my pack off and grab some water. 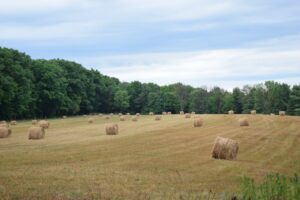 There were large rolls of hay in the field; the contrast of the gold of the hay, dark green of the trees, and the dark gray of the sky presented a good photo opportunity (mile 3.0 – 8:46 am). After finishing my water I set out again. The trail continued along the top of the hill before turning and starting down a steep descent to Newton Road. 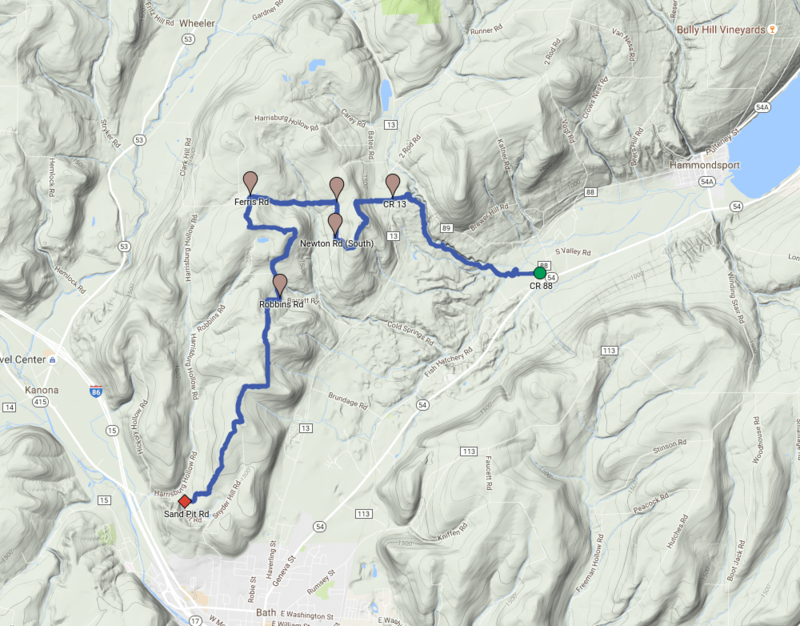 I passed through a few switchbacks and then a long downward angled path before coming out on the road (mile 4.0 – 9:17 am). Newton Road was a small seasonal-use dirt road. As I walked along I noticed wild raspberry bushes growing along the side of the road. I picked a few ripe berries for a snack, most were still green and not ready. Along the road I encountered a little eft (sometimes called a salamander or newt). This one was a yellow-orange color, not the bright orange I so often see. After a short walk along Newton Road I turned left off the road and headed down. I came to a dry creek and crossed quickly and headed back up the other side. Soon after leaving the dry creek behind I came to the Bristol Hills Trail junction (mile 5.1 – 9:48 am). A sign displayed the many miles behind me (east, 375 miles to the Long Path) and miles still ahead (west, 186 miles to the PA border). I continued on past the junction and the trail began to turn into a small dirt road. I followed along the small dirt road for a short distance and then turned left into the woods. The rain had brought out different creatures; the usual chipmunks, squirrels, and small birds were hiding today. Instead I saw lots of bright orange efts and small toads. One small toad hopped across my path and I stopped to take a few pictures. 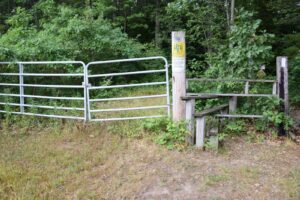 The trail continued a gentle climb up and then I saw a small bench shelter to my right and fields in front of me (mile 5.8 – 10:07 am) . I stopped at the bench shelter and took my pack off. I walked out to the field to take some pictures and then back to the shelter for a short break. The rain had gone, but it was still damp and there were small fog clouds hanging in the valley below. 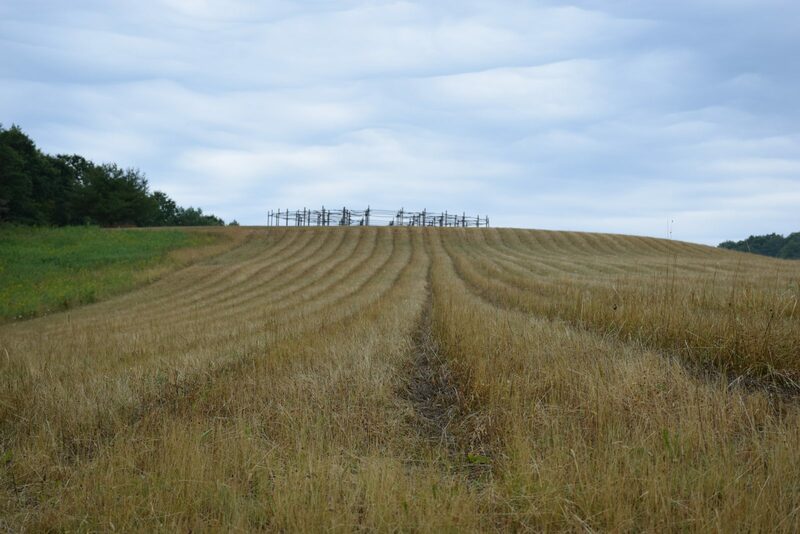 After a break I continued on; the trail turned left along the edge of the field to follow a farm tractor path. It passed through a small section of woods and out into another field. As I came out into the next field I saw an odd circular structure further out in the field ahead of me. As I get closer I could see that it was made of large wooden posts and beams. The posts were placed in a large circle and cross beams connected each of the posts together to form a ring. There were more posts inside of the outer ring creating additional inner rings, each one smaller than the previous. The outer posts were connected by beams to the posts of inner rings as well. Chicken wire has been laid on top of the cross beams. I took several pictures wondering what it was (mile 6.3 – 10:26 am). After my hike I did some research and found that the structure is an arbor used by the PeaceWeavers at their summer peace gathering . I headed back to the edge of the field and continued to follow it along. When I reached the corner of the field the trail turned and followed along another edge of the field. From here I could see back toward the circle and I stopped to take a few more pictures. I reached another corner of the field and headed into the woods. The trail gradually descended. Along the way I spotted another eft, this one bright orange. A short distance later the trail opened out onto another dirt road, Robbins Road (mile 7.1 – 10:44 am). There were a few houses nearby, but the weather had kept the occupants indoors. I trudged down the road past the houses and came to the town line and the trail turned to the right leaving the road heading upward (mile 7.36 – 10:50 am). After a short climb the trail turned to follow near the edge of a field. At the far corner the trees opened to the field and I could see across. The sky was still gray and dark and the clouds hung low. I could see fog rising in the distance beyond the field. I continued on. I came to an old pine tree with signs and a trail register hung on it (mile 8.0 – 11:06 am). I was surprised, I had seen this tree before! A picture of it had just been used on the FLT Facebook page to go along with a post. I signed in at the register, but I did not stop to read previous entries. The trail curled around past the tree and continued on. Once again the trail followed along near the edge of a field. At the corner of the field it turned and continued to follow near the edge. 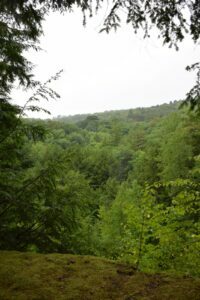 The trail began to descend and came to an open area of an old overgrown field and shortly after I came upon the Hickory Hill Lean-to (mile 8.75 – 11:25 am). It faced away from the trail and looked out across the valley. Three men came around from the front of the lean-to; I stopped to say hello and we chatted for a few minutes. They had come up from Hickory Hill Campground below for a short hike. I told them about the FLT and they asked if there were any good views back the way I had come. I told them there were a few, better ones were further back than they wanted to hike. I wished them a good hike and continued on my way. A short distance after the lean-to I came to a trail that led back down to the campground. A sign indicated that it was a 1/2 mile. I continued on past the junction and back into the woods. The trail again followed along the edge of more fields before finally opening out into one (mile 9.7 – 11:49 am) . I was at the top of the field and could see across the valley below and to the hills all around. The clouds were still low and fog was hanging in the valley. 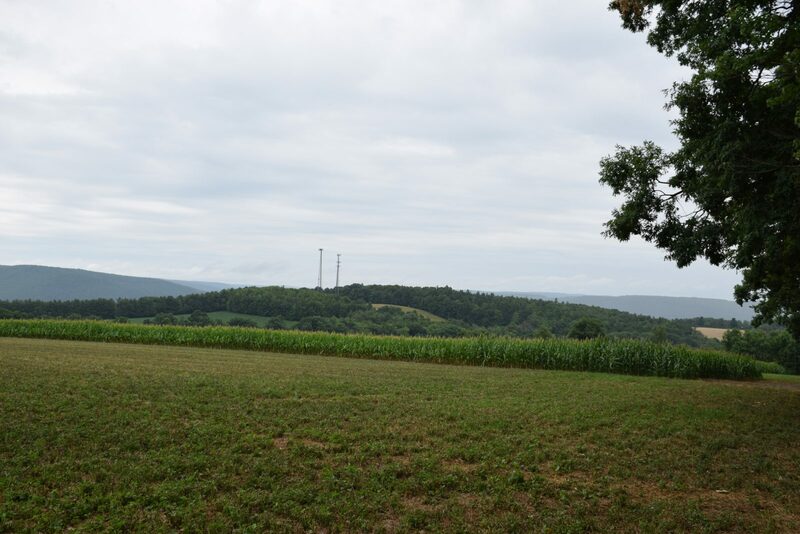 I could see a pair of cell towers on a nearby hill. I walked down along the edge of the field, there were rows of corn growing in part of the field. At the bottom of the field the trail turned back into the woods. I had some difficulty finding the trail at first and had to stop and search. After finding the trail I continued on heading down. The trail again passed near the edge of yet another field and then left it behind before making a turn to the left and then back to the right. A short distance after I climbed down a bank to Sand Pit Road (mile 10.54 – 12:08 pm). I had arrived at my turnaround point. I took a few pictures and then headed back up the trail. Soon I found myself back in the field and climbing up past the rows of corn. I crossed the junction to the campground and caught the faint smell of a wood fire; probably from the campground below. It was nearing 1 pm and I was getting hungry, I planned to stop at the lean-to for lunch. As I neared the lean-to I could see smoke coming up from the fire pit; a family had hiked up from the campground and they were having a cookout. I stopped and chatted with them for a bit and then I left them to their cookout and continued on up the trail. At the top of the hill I found a relatively dry patch of ground to stop at and have lunch (mile 13.0 – 1:15 pm) . It was near the old pine with the trail register. The temps had remained in the 60’s all day; which was nice for hiking, but felt a little cool when stopped. I did not take a long rest because I was starting to feel a little chilled from being damp from the rain earlier and a light breeze that had come up. After a little rest, some food and water, and a change of socks I moved on. 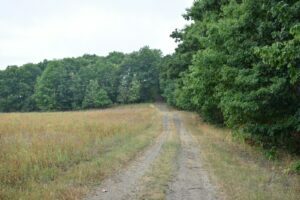 The trail passed by the fields and then turned to open out on to Robbins Road (mile 13.8 – 1:57 pm). I hiked up the road and past the houses and then I headed back into the woods. I soon found myself back in the field below the strange circular structure. I walked along the edge of the field and turned at the corner, passing near the structure. I continued on up the farm tractor path and into the woods and then to the field beyond. The trail turned to the right to leave the field behind and I was back at the bench shelter (mile 15.25 – 2:31 pm). I stopped once again for a break. After some water and a snack I continued on and came to Ferris Road. I turned to the right to follow it for a short distance before it faded away. I saw another bright orange eft sitting on a log and stopped to take some pictures. The trail descended and crossed the creek which was still dry; the little rain from the morning was not enough to put any water in it. A short climb up from the creek and I was back on Newton Road (mile 16.65 – 3:16 pm). My feet and shoulders were getting sore and I was tired. I picked some of the wild raspberries that were growing along the side of the road and the sweet taste gave me a little boost. I turned off Newton Road and headed up the trail to climb to the top of the hill. I worked my way up through a few switchbacks. I was glad that it was cool as I climbed. I reached the top and turned to the left to continue along the top of the hill. 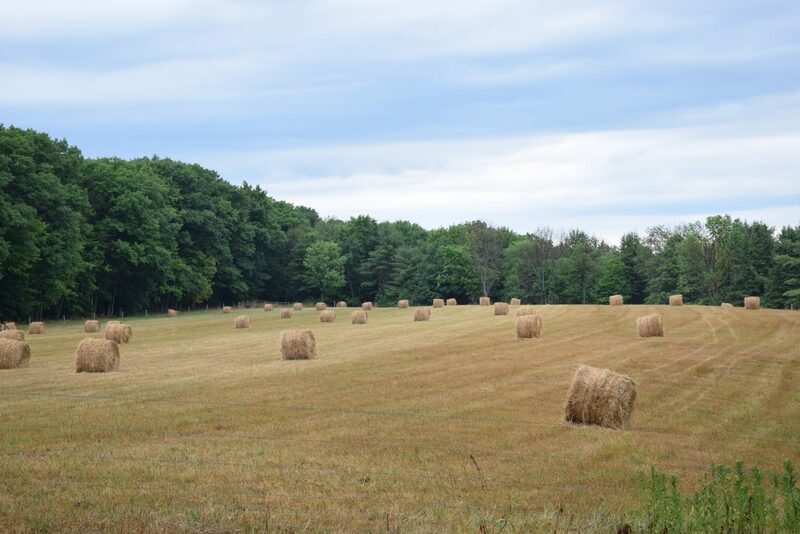 I could see the field with the hay rolls ahead of me that I had stopped to take a picture of earlier. This time I continued on turning to the right and heading down a steep section of the trail. I had to go slowly; the ground and leaves were wet and slick and my legs were tired. The muscles in my legs were aching by the time I finally made it to the bottom of the hill. The trail came to the small field next to CR 13 before crossing over to another field (mile 18.25 – 4:04 pm). Earlier it was raining as I passed through so I had not stopped to take pictures, but now I was able to. I crossed CR 13 and headed across the second field. As I neared the far side of the field I notice that there was a stile next to the closed and locked gate. I had missed it before and had just worked my way around the fence. This time I used the stile to climb over the fence. The trail came back to Micthellsville Creek and the deep gorge that it ran through. I followed along, passing back through the small field from earlier, past the overlook, and then past the waterfall area that I climbed down to. I came back to the old railroad bed and walked the short distance down the overgrown track before turning and leaving it behind. Ahead of me I could hear the fast-moving stream and I knew I was almost back. 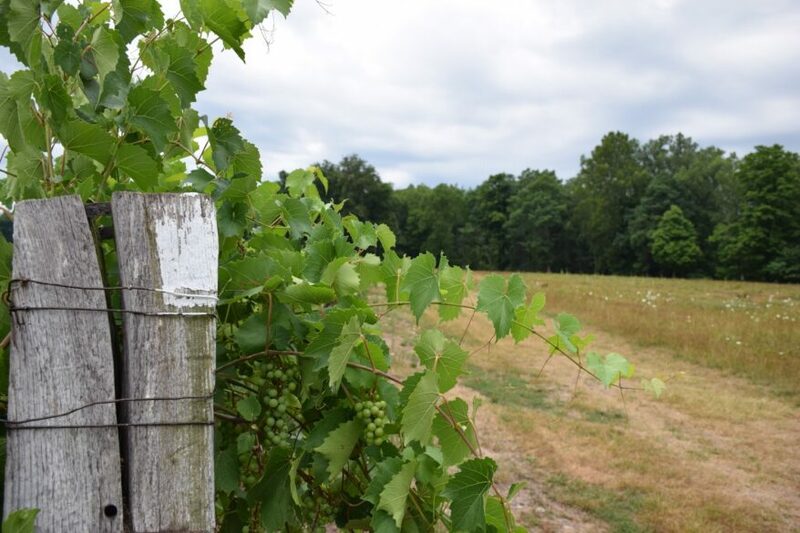 I crossed the bridge over the stream and turned to follow it a short distance before coming back to the vineyard fields again. I trudged back across the fields; the crossing seemed to be much longer this time. And finally I was back at my car (mile 20.86 – 5:07 pm). I dug my keys out of my pack and opened the doors. I had left a change of clothes in the car and changed into a clean and dry shirt. I changed out of my boots and back into my sandals, stowed my pack in the car, and started the long drive home. As I drove along the highway the sun began to peek out and I could see strips of blue sky; of course.